Communities must be empowered to plan for the future effectively, in light of resource constraints and increasing natural and man-made hazards. Practical Action has developed and pioneered the ‘From Vulnerability to Resilience (V2R) Framework’, which enables them to do just that, by addressing four key factors that contribute to vulnerability: exposure to hazards and stresses, fragile livelihoods, future uncertainty, and weak governance. 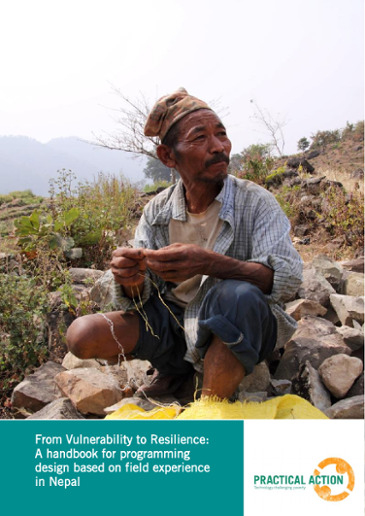 Building resilience must inevitably begin with an analysis of the existing vulnerability context: the policies, processes, and institutions unique to each neighbourhood, community, country and region that affect the level of vulnerability a person experiences. The FLORES framework is being developed by Practical Action in collaboration with the International Institute of Applied Systems Analysis (IIASA) to facilitate systematic, in-depth analysis of the vulnerability context. The incidence of disasters is increasing, and climate change is expected to further increase their frequency and severity. Poor people will be the hardest hit, because they more often live in risk prone areas, their livelihoods are dependent on natural resources, and they have fewer resources to protect themselves. It is vital that impacts are reduced before these events occur, rather than responding after disasters have caused widespread devastation. A core challenge is effective future planning with limited resources; ‘From Vulnerability to Resilience’ (V2R) aims to empower poor people, communities, private sector and local governments to effectively plan for the future in light of resource constraints and increasing hazards. What is the V2R framework? Vulnerability is the degree to which a population or system is affected by hazards and stresses, including the effects of climate change. The causes of vulnerability are multi-dimensional, relating to specific hazards such as earthquakes, and socio-economic circumstances such as poor education or lack of savings. Vulnerability may be increased by broader trends such as climate or economic change, which are often not well understood. Poor people usually have weak access to and influence over the institutions and policies that affect them, leaving them little opportunity to address the underlying causes of their vulnerability. 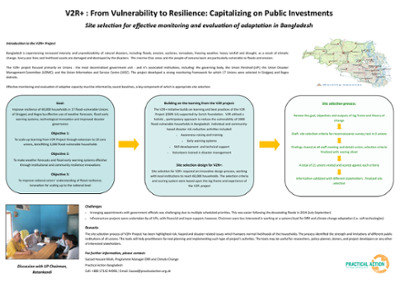 The V2R framework details the key factors that affect vulnerability - livelihoods, hazards and stresses, future uncertainty, and governance – illustrating and enabling exploration of more integrated ways of strengthening resilience. A livelihood comprises the resources (including skills, technologies and organizations), activities and choices drawn upon by individuals and households to make a living and have a good quality of life. The livelihood options available to individuals and households depend on the diversity of resources, skills and technologies they are able to access. People with poor access are more likely to be forced into dangerous activities, and have fewer alternative strategies to fall back on when shocks occur. Building livelihood resilience means improving the diversity and security of people’s livelihoods by improving access to assets, skills, technologies and markets for enhanced production, income and security. This includes strengthening community organisations, and forging links with service providers to build capacity and voice. Hazards and stresses may be natural, like the monsoon, or manmade, like an economic recession. They may be sudden and unexpected, as when an earthquake strikes, or a slow onset disaster, like drought. Stresses refer to lower-impact events and seasonal factors, such as price fluctuations or gradual changes in climate. A livelihoods approach involves understanding how people and their livelihoods are exposed to and affected by hazards and stresses. Poor people are often more vulnerable, due to a lack of choice in where they live and work, and a lack of resources to cope with the impacts. For example, poor people are more likely in flood and landslide prone areas, and less likely to have insurance to recoup losses following a disaster. Building resilience to hazards and stresses involves: building the capacity to analyse hazards and stresses; improving hazard prevention and protection; increasing early warning and awareness; establishing contingency and emergency planning; and building back better. Governance embraces public and private, formal and informal organisations, policies, and processes, operating on local, national and international levels. It is key to building resilience because it determines how people access the resources, skills, technologies and markets they need to strengthen and diversify their livelihoods. Improving governance and the responsiveness of institutions and policy involves: advocating for decentralised and participatory decision making; strengthening links between local, district and national levels; promoting integrated approaches to livelihoods, disasters and climate change; addressing underlying systemic causes of vulnerability; and nurturing equality and transparency in decision making processes. Long term environmental, economic, social and technological trends can have unpredictable effects, contributing to uncertainty about the future viability of livelihoods. Dealing with increasing uncertainty, including climate change, has led Practical Action to prioritise adaptive capacity. Adaptive capacity refers to the ability of individuals and communities to assess their situation in light of on-going changes, and effectively modify their livelihoods to respond. Learning and experimenting with new technologies in local contexts is essential to building adaptive capacity. For example, flood early warning technology developed in a temperate country may not be suitable for a monsoon region; technologies should be designed or modified to fit the local context to be as effective as possible. Building community resilience to climate change and other long-term trends will require: raising awareness of long-term trends and their impacts; improving access to relevant and timely information; building confidence and flexibility to learn and experiment with new technologies; and nurturing collective approaches and develop adaptive options based on the collective knowledge and experience of the larger group. 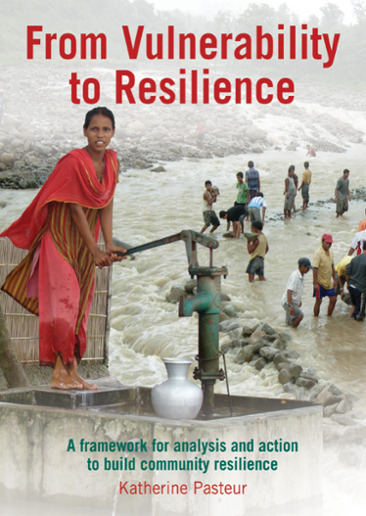 This handbook is an excellent starting point as it provides a straightforward, step-by-step guide to understanding changing disaster risk and how to translate this into a set of possible actions. A poster produced for the CBA9 conference which illustrates our community based climate change and adaptation work in Bangladesh.